Almost one year has passed since we released the Matrix RGB click board. That click board became without a doubt one of the most popular ones we have. The wide range of possibilities and easy usage are probably the main reason for its high popularity. On the recently held Embedded World fair, the Matrix RGB click board found another usage in the NFC demo application. The whole application tracked a lot of attention there, but in this article we will only pay attention to RGB panel part. For this event, an optimized version of firmware was developed especially for 2x2 panel size. When compared to the previous version of the firmware, this one is quite simple. Your application is placed on an external MCU. The FT900 placed on the click board™ is only in charge of panel control. The firmware is capable of displaying 64 colors, which is enough for this particular task. Scrolling is fast and smooth but limited to one scroll step per 10 ms. Another great thing is that there is no more flickering. Text processing is now a job for your application, which allows you to chose the needed font size. A new feature of the updated version of firmware is that it can work standalone. You can check the firmware directory in the GitHub repository and try your own scenario. The new version is also capable of storing 30 images which can be displayed by request from the external MCU or by implementing your own scenario inside the firmware. Don't forget that FT90x mikroProg is needed if you decide to work with Matrix RGB click as a standalone application. Keep in mind that before the usage of matrixrgb_text you have to setup the font by calling matrixrgb_set_font . A 2x2 panel size is more than enough to make an advertising panel for your shop or anything else you have in mind. The library makes it simple to create an application, so you will not have to spend a lot of time making your own. What might be your main task is building a frame that is good enough to hold 4 panels ordered in a 2x2 manner. It is very important to note that the power consumption, when very bright pictures are used, goes above 4 amps per panel, so a good power supply is a must. mikroProg for FT90x is a fast programmer and hardware debugger. Smart engineering allows mikroProg to support all of FTDI Chip’s FT90x devices in a single programmer. THE COMPLETE HEXIWEAR DEVELOPMENT KIT Note: Check your nearest distributor for stock. 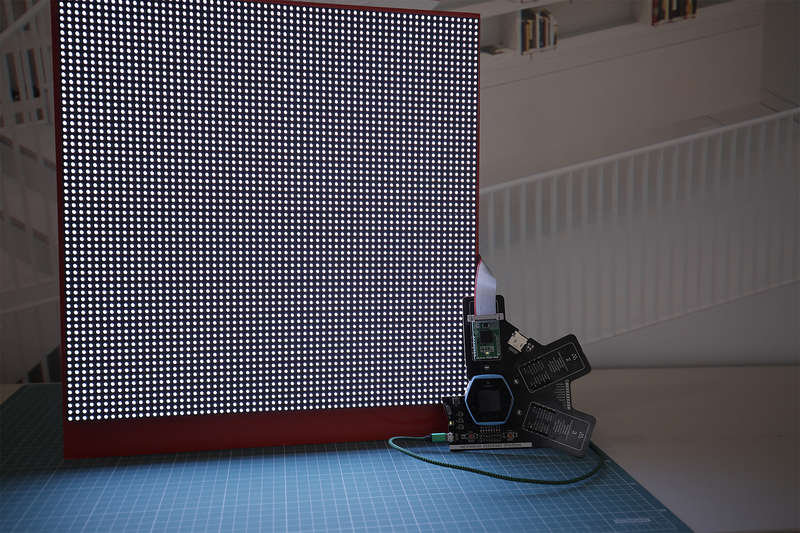 Hi-brightness RGB LED matrix panel, with 1024 RGB LEDs arranged in a 32x32 grid on the front on a 6mm grid, total size 190x190mm. Comes with one IDC cable and a power cable.